My favorite part of the quilting and distressing. I’m just gonna say it again: this was fantastic fun! That raven embroidery caught my eye on Facebook and then when I saw the Michael Miller Nevermore fabric, it sealed the deal on where to start. I had no firm plan for the whole quilt, but I started with my Feature It! pattern (that you can get free here) because it’s just so quick to make and easy to customize depending on what fabric and techniques you use. I just added the embroidery elements and inked lettering and other things as I went along and came up with ideas. I’m sure you can tell I fell in love with Urban Threads embroidery designs and the whole Gothic/Steampunk/Nevermore theme just a little bit! I’ll probably go into more detail about the construction techniques I used at a later date (some of which were really experimental for me and way outside my boxes! ), but here’s the quick list of techniques and some of the supplies used: machine piecing, machine embroidery, free motion unmarked machine quilting, inking, painting, distressing, Mettler, Sulky, Iris and Aurifil threads, Tsukineko Fabrico Markers and Pigma Micron pens, SoSoft Fabric Paint, beads, watch parts, ribbon, floss, and Hobbs Heirloom Wool batting. I really love how this quilt turned out–I think it’s one of my favorites that I’ve ever done, but then again, I’ve probably said that about each quilt I’ve done…until the next one! 😉 ‘Tis Just the Wind…It may have to find a permanent home on the wall year round and not just at Halloween. Or maybe I’ll just leave it there on the hall tree, since no one ever hangs anything else on it anyway! Now I have a giveaway for you! Leave a comment to let me know you’ve been here and tell me what your favorite quilting technique is! 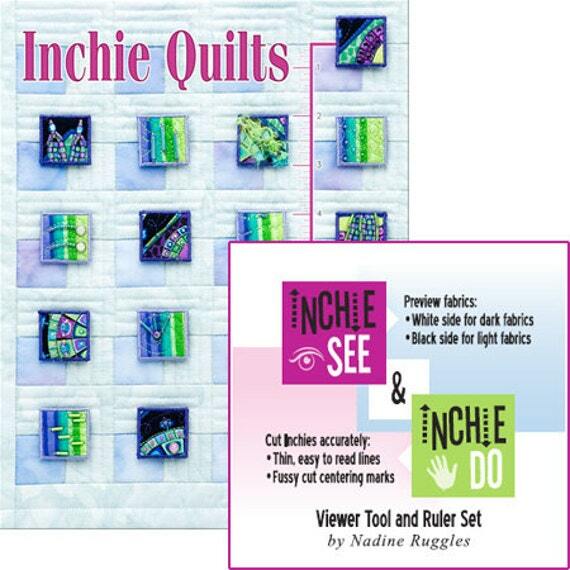 I’ll enter you in a drawing for my Inchie Quilts book and InchieSee & InchieDo Viewer Tool & Ruler Set. The lucky winner will be drawn randomly on Sunday, November 3 at 11:00 p.m. EST. I’ll ship anywhere! I hope you have enjoyed the Wicked Blog Hop as much as I have. Thanks for stopping by and I hope to see you back soon! Update: Thank you all for your comments and compliments on my quilt. Your kind words caused lots of Warm Fuzzy Feelings over here! I’m pretty sure I answered each of your comments by email, and I hope Outlook didn’t make any comment emails disappear. If I did miss anyone, please know that it wasn’t intentional! Amazing work!!! Thanks for sharing, it’s beautiful! I love the raven with that Nevermore fabric – fabulous! Lately, my favorite technique has been paper piecing. Thanks for the chance at the giveaway. Your quilt is amazing and gorgeous!!! Wow! Beautiful quilting also! Wonderful over the top technique wise quilt—-WOW! Well done, Nadine. Welcome to the wonderful world of blog hop participation too. My favorite part is piecing and I have gotten more adept at machine button hole applique but hand work other than binding will always be my first love. Unfortunately there is never enough time to squeeze hand quilting in around here. Your wall hanging is so amazing. So creative. I absolutely love it. Brought back memories of the 9th grade when we had to recite a poem in English and I had a crush on the single young teacher so I recited the Raven. Took the whole class but I did it. WOW Thanks for sharing. That wall hanging is spooktacular!!! Love the ravens, and the colors, and the embellishments, and just everything about it. I would be tempted to leave it up all year myself. It is beautiful. I LOVE your wall hanging!!! favorite technique? .. I don’t really have one,but do like trying!!! This is just the best candy that I could receive on Halloween…..Eye Candy! No calories, just lots of wonderful details to catch my attention. Thanks so much for this wonderful project and for the great giveaway! Happy Halloween! I love machine piecing the best. I have to say I love your wicked quilt, and wish there were kits for that one. Just LOVE it!!!! scrappy quilts. Still learning the quilting part. This is one of the best Halloween wallhangings I have seen. Love it! My favorite part is the quilting. I love quilting on my longarm. Wow….what an awesome job on the quilt wall hanging…love, love, love it and thank you for the free pattern. not sure what quilt technique I like the best….all of them as I love to sew and quilt. Thank you for the giveaway…. As a new quilter I can’t say if I have a favorite technique yet but I do know that I love hand work. I really enjoy EPP and I am just starting to teach myself needle turn applique. Thank you for sharing your absolutely stunning quilt…you certainly used a lot of different techniques!! I love love it!! Stunning! So elegant and creepy at the same time. You did an amazing job. Thanks for sharing. i really like your wall hanging — it is so different from the regular Halloween items we all do. but, it is beautiful and i love the locket and keys, birds, and bats. really unique and so nicely done. cheers to you!! Oh my goodness, that is the most awesome wall hanging I’ve ever seen! It is beyond cool! Fantastic job! I am so in love with faw edge applique right now. What a great project. I love the lace crow, just lovely. My favorite technique at the moment is epp. and hand quilting. OMG! I LOVE this! Everything from the embroidery to the color choice to the quilting is perfection. I wouldn’t blame you for thinking about displaying it all year. My favorite quilting technique is turned edge applique. I find it relaxing. Wow, I love your quilt! Urban Threads is a definite inspiration for me, too. When it comes to quilting methods, doing it by hand is my preferred way. It’s easier for me to get precise results (wonky is not something I could ever bring myself to do) and I like the extra little touches that can be added. The only part of quilting that I don’t prefer to do by hand is attaching the binding. Once it’s on the front, then I’ll finish it by hand on the back. WOW! This is just amazing, I would love to hear more on how you made it, a piece of Art, it is so beautiful. Wow is all I can say. I love your quilt. I love fmq but I am not real good at it yet but I will be with practice. Wow! I can’t believe your absolutely amazing quilt! It is boo-tiful! I would love to see it in person. Favorite quilting technique? Not sure it’s a technique, but I love scrappy quilts. They are my favorite to make. Somehow all those odd little bits just fit together to make such a wonderful quilt. That is an awesome design, I would love to have one just like it. Wonder if I can do that? Maybe if I get wicked I can. Thanks for sharing and the giveaway. I love to piece quilts and then quilt them. lovelovelove your quilt! I have only done stipple & straight line quilting but itcing to try more varried stitcing- just gotta finish quilt top I’m working on, get my nerve up and go for it! Hello, hello. I am so glad to have met you on this Wicked Hop. I am in TOTAL AWE of your quilt. I keep scrolling back to see it again and then I see a new section. I only wish I could see it in person. Inchie Quilts is a new thing to me and I wonder if that’s what you did to the side of the owl and the raven. You’ve captured me and I’m now a new follower. Fantabulous!!! Wow! That is a beautiful piece there….very very impressive! My favorite quilting technique is machine quilting…so many quilts, so little time!! Awesome!!! That is beautiful! Amazing! I’m new to quilting, and I don’t know many techniques, but I enjoy machine piecing and paper piecing. Thanks for the link and the chance to win. Awesome quilt. I like piecing the most. I love picking out the pattern and fabric the best! LOL I do like piecing too. I love your quilt! WOW!! It is incredible!! You did a fantastic job!! Your book looks like a lot of fun!! I am still learning but for now my favorite part is hand stitching a binding on. I am not sure if that is a technique or a step. But I love that I can do it while watching a show and hang out in the living room. This is an amazing quilt. It has it all. You are not only creative but a real artist with fabric. Love your quilt. You are so creative. I would love one of your books..Thanks for sharing your halloween with us. great for a wicked banner….! Love all the different elements of your quilt, I’ll be checking out the pattern info for sure, as I do love to decorate with quilts. Thanks sew much for sharing and hosting a give away too. Fantastic quilting and embroidery work. I like to combine quilting, embroidering and Sergering. Thanks for sharing and thanks for the giveaway chance. My favorite part of quilting is seeing the whole thing, all the bits and pieces, come together. Wow wow wow. I agree with you – this work of art should be displayed all year long! I’m looking forward to reading more posts on your techniques. Thanks so much for sharing! I didn’t know about the Nevermore fabric, or the Urban Threads embroidery designs. I’m a steampunk fan and I’m definitely going to check those out! Thanks so much for sharing!